These new and revised cast iron spindles allow you to add 12" disc brakes and drop your car 2". Works with 1970-78 Camaro calipers and 1988-1992 Camaro 1LE 12" rotors. Will accept most 15" disc or larger custom wheels. 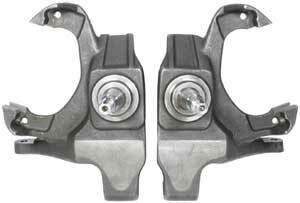 Provides a full 2" drop and does not change the car's steering geometry.